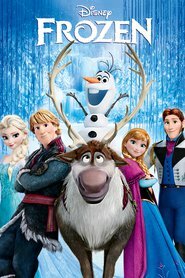 Here you will find Frozen 2013 film trailer, pictures and plot. IMDB rating and user reviews will help you to understand if you should watch this animated movie in theater or buy on DVD. Also don't forget to check the similar cartoons! Description: Young princess Anna of Arendelle dreams about finding true love at her sister Elsa’s coronation. Fate takes her on a dangerous journey in an attempt to end the eternal winter that has fallen over the kingdom. She's accompanied by ice delivery man Kristoff, his reindeer Sven, and snowman Olaf. On an adventure where she will find out what friendship, courage, family, and true love really means. Rating: The average rating is calculated on the basis of 105 votes. Is Chris Buck, Jennifer Lee your favorite director? And do you like children,comedy,romance,cartoon,musical,adventure,family,fantasy genres? Then you certainly need to buy Frozen on DVD or watch the animation film in theater.